The Oros treated us to brunch in honor of my birthday. 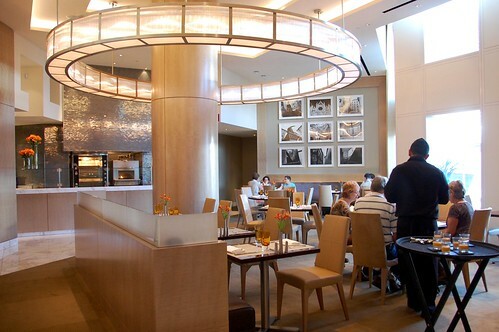 I was itching to return to the beautiful Mandarin Oriental, so I suggested MOzen Bistro for a simple sandwich brunch, as we were going to gorge ourselves at dinner later that night. I loved this space so much. So full of natural light. So simple. So clean. Look at Mr. Monkey and our cutie-patootie friends studying their menus so seriously! And, yes, that is my gigantic Epiphanie Lola camera bag hanging out on my vacated chair. I didn't need the teeny-tiny spoon. 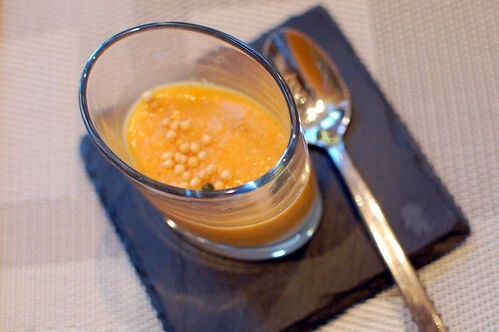 I downed this chilled tomato soup with vegetable foam straight from the shot glass. Cool and refreshing. Savored the minuscule crunchy potato specks. 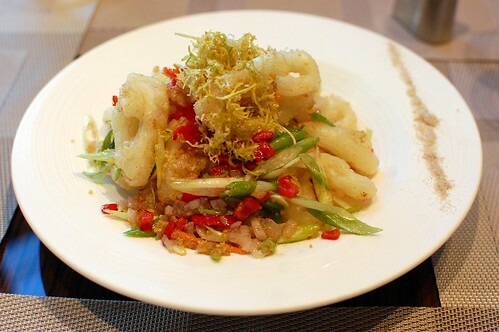 Salt and pepper calamari -- lightly battered squid, wok-tossed with chili and garlic finished with five-spice salt ($15). My favorite dish during this meal! Delicate in both battering and tenderness, yet full of flavor. I'm a sucker for salt-and-pepper anything. In hindsight, I wish we'd ordered more Asian-inspired vittles. 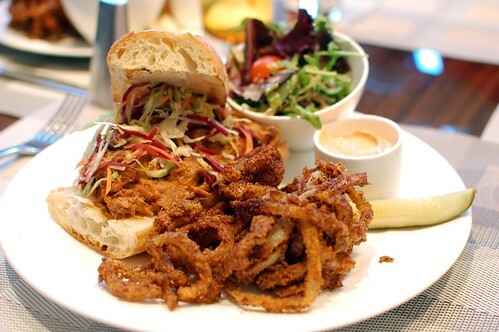 24-hour BBQ pork -- pulled pork shoulder basted with house-made smoked mango barbecue sauce on a crusty baguette topped with chili-lime slaw and served with ancho-dusted onion rings ($15). 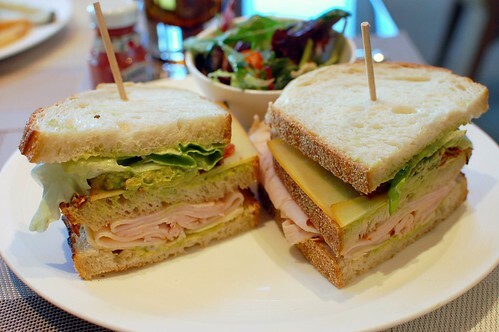 Mrs. Oro and I both enjoyed this sandwich. I could taste the 24 hours that went into the pork. The sandwich packed a big flavor punch, and the onion rings rocked. 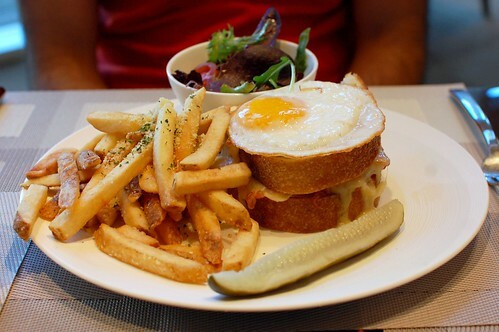 Croque Madame -- grilled thick-cut sourdough, Serrano ham and Gruyere cheese topped with a gratin of Mornay and a sunny-side-up egg ($19). Mr. Oro seemed to enjoy his French classic with a Béchamel twist. Smoked turkey club -- toasted sourdough, pesto aioli, smoked turkey, crisp bacon, mashed Haas avocado, tomato confit, Gruyere, and smoked cheddar cheese ($16). Mr. Monkey and I were both surprised by how good this seemingly common sandwich was. Really fresh and high-quality ingredients. Definitely not your run-of-the-mill picnic food. 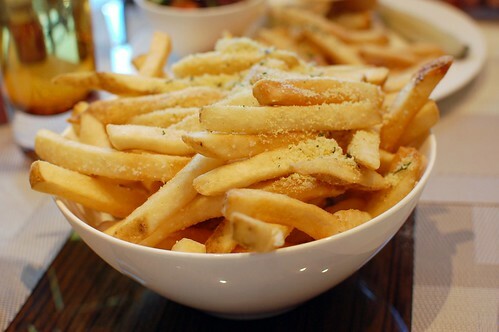 House-cut garlic Parmesan French fries. Delicious, but I have a bone to pick with our server. We ordered this because the menu did not indicate that both Mr. Monkey's and Mr. Oro's meals came with these fries already. Had we known this, we definitely would've ordered a different extra side for the table. A good server would've mentioned this to us, no? 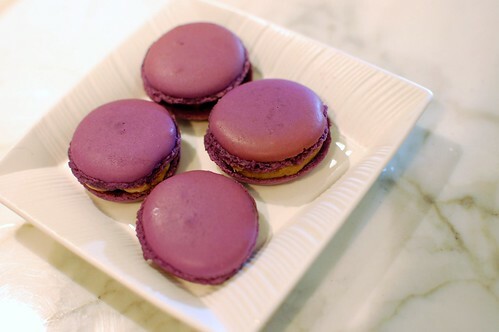 Peanut butter and jelly macarons! Love, love, love. A fancy resurrection of an old childhood favorite. But this was Server Fail, Part Two. How? As we exited the restaurant, we admired these beauties at the open dessert/coffee area right outside the dining room. While chatting with the rather jolly pastry chef, he said, "What? You didn't get these after your meal?" Apparently, our server completely forgot to give us our complimentary petits fours, so our friendly pastry chef plated four of these pretty babies, and we nibbled on them while he regaled us with some stories about the masterminds behind the restaurant. 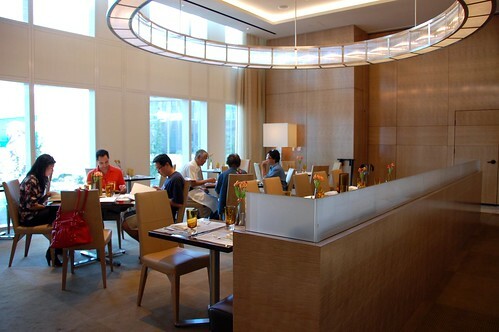 It turns out that the chef de cuisine lived in India for awhile, so the Indian-inspired dishes on the menu are not to be missed. 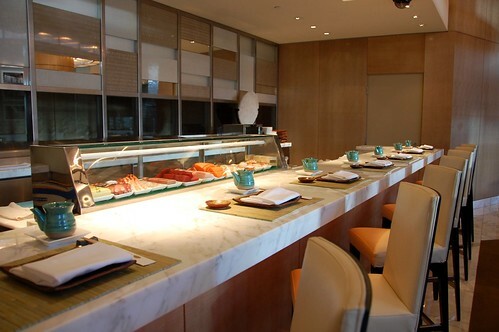 I'll definitely be back for those, as well as for all the other pan-Asian delights. 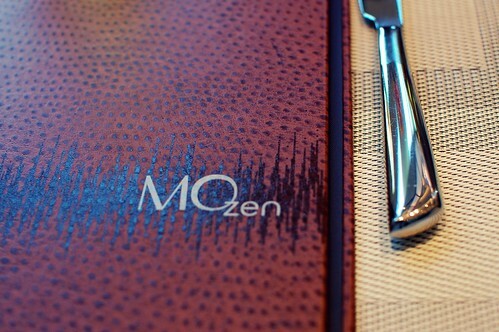 MOzen Bistro was a lovely find for a peaceful brunch, a rarity on The Strip. As Mrs. Oro noted, we couldn't even tell we were in Vegas anymore. Those pb&j macaroons look awesome! How adorable! The salt and pepper calamari looks delicious. All your posts about Vegas are making me really really want to go! I haven't been in a while. what a gorgeous place! those onion rings look fanfreakingtastic! i love your pics! happy belated bday! Pretty awesome "light" lunch, Weez. The PB&J macs look so cute! Happy belated birthday to you! those macarons look fantastic. and i LOVE amuse bouche..s. i don't know how to pluralize that. What a fancy brunch with an amuse bouche! Gorgeous gorgeous gorgeous. Your blog is bad for my postpartum diet. For real, yo. I <3 your blog. You know that. But yes, comments are the best. Can't believe you're complaining about measly 10 comments. Server fail indeed. I think we're headed back to Vegas this summer so we'll keep that place in mind. I am dying over the PB&J macarons. Seriously. You're killing me. I'm a suckerbitch for Croque Madam. omg. peanut butter & jelly macarons? and i wish i could describe myself as a "minuscule crunchy potato speck."